At 39 inches the Tango is 5 inches narrower than a Honda Gold Wing motorcycle. The Tango T600, costing $85,000 USD (! ), is a two seat luxury, high performance vehicle with a carbon fibre body, race-tuned suspension, Connolly leather interior, and a 400-watt stereo. With 1,000 ft lbs of torque coming from two electric motors driving the rear wheels, the T600 can reach 60 MPH in 4 seconds and a top speed of 150 mph. 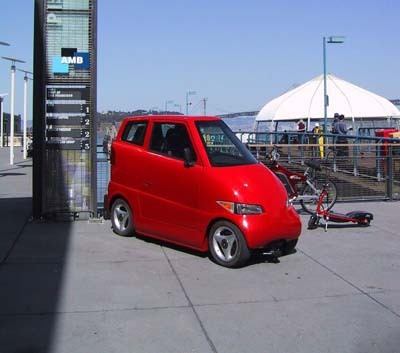 With the driver and passenger sitting in tandem (one behind the other) the Tango T600 was designed to help with the growing congestion and parking problems associated with modern day cities. Also because the T600 is a zero emissions vehicle it is exempt from many tax, congestion and parking regulations. Saved money you can put towards the payments! Nice idea. But to be fair it is hideous.